Armen Louis Gilliam (May 28, 1964 – July 5, 2011) was an American professional basketball player who played 13 years in the National Basketball Association (NBA) from 1987 to 2000. He also played one season (2005–06) for the Pittsburgh Xplosion of the American Basketball Association. Gilliam returned to the court after retirement as the head basketball coach for the National Collegiate Athletic Association (NCAA) Division III Penn State Altoona Lions from 2002 to 2005. Gilliam began his college basketball career in 1982–83 at Independence Junior College in Independence, Kansas. That year, Gilliam was a standout player on the basketball team that reached the Junior College Finals and finished 6th in the nation. Gilliam averaged 24.9 points and 14 rebounds in five tournament games and was named to the National Junior college finals all-tournament team. Gilliam continued his college basketball career with UNLV. Gilliam played for UNLV from 1984 to 1987 and was an integral part of a team that was 93-11 in the 3 years he played for the UNLV Rebels. The UNLV team was ranked number one in the country for most of the three years Gilliam competed and the team made it to the NCAA tournament every year during his stay. In 1987 the team reached the "Final Four and Gilliam was named to the NCAA Final Four all-tournament team. Gilliam scored 998 points in his senior year which was and still is a school record for the most points scored in season by a UNLV player. Gilliam also played on the UNLV team that won 38 games in a season which is still a N.C.A.A. Division 1 record for most wins in a season. In 1987 Gilliam was selected for a number of All-American Teams and voted the top contender for the John Wooden award. While at UNLV, teammate Frank James gave him the nickname "The Hammer" after seeing Gilliam's biceps combined with his pounding action under the basket. Gilliam said, "He knew I was from a steel town, too. I think that was a factor." The Los Angeles Times dismissed the notion that he got the name from a baking powder, Arm & Hammer. Gilliam was selected to play on the 1986 USA Basketball Team. This team fielded college stand outs likes: David Robinson, Kenny Smith, Tommy Amaker, Tom Hammonds, Charles D. Smith and Derrick McKey. The 1986 USA basketball team, led by head coach Lute Olson of Arizona, proceeded to shock the world with its play. The international community did not consider the team a medal-contender, but they advanced to the championship game and competed against the heavily favored Russians for the gold medal; overcoming great odds, they won the 1986 World Championship. 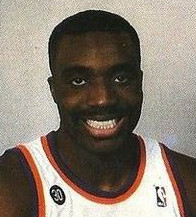 After graduating from UNLV with a degree in communications, Gilliam was the second pick in the first round of the 1987 NBA Draft. As a rookie Gilliam was named to the all-rookie team (first team) in 1988 while playing for the Phoenix Suns. He went on to play 13 years in the NBA. Gilliam averaged 20 points and 9 rebounds for the Charlotte Hornets, played three years with the Philadelphia 76ers, and played three years with the New Jersey Nets, where he averaged between 12 and 18 points and 6 to 9 rebounds a game. He later played for the Milwaukee Bucks and finally the Utah Jazz. In 2001 Gilliam was named head coach of Penn State McKeesport's men's basketball team, which played at the junior college level. In his first year as a head coach, he helped lead the team to a regular season record of 12-7. The team played well in the playoffs and reached the conference finals. The next year Gilliam accepted the Head Men's coaching position at Penn State Altoona, where he coached from 2002 to 2005. He had a couple of unsuccessful seasons as their head coach. Among other awards Gilliam was inducted into the Bethel Park Hall of Fame for the Sport of Basketball in 1997 and the UNLV Hall of Fame in 1998. He was selected to the Division 1 All- American Team in 1987 and was a finalist for the John Wooden award the same year. He was honored in 1996 for scoring 10,000 points during his NBA career. In November 2007, his college jersey (#35) was retired at half-time of the UNLV vs. Wasburn University game in Las Vegas. Towards the end of his NBA career he altered the spelling of his first name from "Armon" to "Armen" because he was tired of it continually being mispronounced. At the time, he was quoted as saying: "Most people pronounced it Ar-MON. I've been correcting people so long that I got tired of it. I just thought that if I put the 'e' in there, it would make it a lot easier to pronounce. I'm not Muslim. It's not religious or anything like that." ^ Downey, Mike (March 28, 1987). "The Hammer Can Deliver a Pounding". Los Angeles Times. Archived from the original on July 17, 2011. ^ "Armon Gilliam bio". NBA. Archived from the original on June 30, 2002. ^ "Men's Basketball Looking Up". Penn State Altoona. Archived from the original on July 22, 2011. ^ a b ESPN.com news services (July 6, 2011). "Armen Gilliam dies after collapsing during pickup game". ESPN. Associated Press. Retrieved July 6, 2011. ^ Fittipaldo, Ray (July 6, 2011). "Former NBA star Armon Gilliam dies". Pittsburgh Post-Gazette. Retrieved July 6, 2011.